At last night’s Board of Commissioner’s meeting, Fire Chief Gary Meek had the honor of pinning our two newly promoted Captains, Troy Smith and Colby Titland. The Captains were joined by their families and coworkers as they took their oath and received their badges. Captain Smith started his Emergency Services career in 1991 working for a private ambulance company. He received his paramedicine degree in 1994, then transplanted his family to New Mexico to further his experience as a paramedic. In 2002 Smith moved back to Washington as he accepted a firefighter/paramedic position with Snohomish County Fire District 7. Through his career at Fire District 7 he qualified as a Driver Operator, was promoted to Lieutenant, and then promoted to Medical Services Officer. In 1999, Captain Titland started with Fire District 7 as a firefighter in our resident program. He was hired as a career firefighter in 2001. 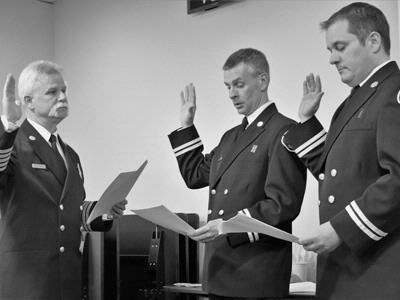 Through his career at Fire District 7, Titland became a qualified Driver Operator, became a member of the Snohomish County Hazardous Materials Team, was promoted to Lieutenant, and was part of our Health and Wellness Task Force. Captain Smith and Captain Titland are assigned to the Training Division where they will coordinate the rigorous training activities for the District. They will work collaboratively with other districts for specialized training throughout Snohomish County. Both Captains embody Fire District 7’s slogan of “Earning Trust Through Action” as they are dedicated to improving the service to our citizens.